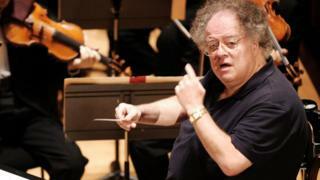 Conductor James Levine has said sexual misconduct allegations against him are "unfounded", days after his suspension by New York's Metropolitan Opera. "As anyone who truly knows me will attest, I have not lived my life as an oppressor or an aggressor," he said. Mr Levine has been the Met's music director for 40 years but the Met has said he will not appear this season. Three men have accused Mr Levine of abusing them decades ago when they were teenagers. The Met has appointed a law firm to investigate his actions. He said he hopes to be able to continue his work and that "in time people will come to understand the truth". As understandably troubling as the accusations noted in recent press accounts are, they are unfounded. As anyone who truly knows me will attest, I have not lived my life as an oppressor or an aggressor. I have devoted my energies to the development, growth and nurturing of music and musicians all over the world - particularly with the Metropolitan Opera, where my work has been the lifeblood and passion of my artistic imagination. My fervent hope is that in time people will come to understand the truth, and I will be able to continue my work with full concentration and inspiration. Mr Levine retired for health reasons in 2016 but has continued to work with the opera as music director emeritus. The Met announced on 2 December that it was investigating a claim based on a 2016 police report in which a man accused Mr Levine of abusing him as a teenager in the 1980s. Peter Gelb, general manager of the Met, told the New York Times it had decided to suspend its relationship with the conductor and cancel his forthcoming engagements after learning of the accounts of two other men who described similar sexual encounters beginning in the late 1960s. "While we await the results of the investigation, based on these news reports, the Met has made the decision to act now," Mr Gelb said in a statement, adding: "This is a tragedy for anyone whose life has been affected." An Illinois police report, seen by the New York Times, said one of the alleged victims claimed that the abuse began in 1985 when he was 15 and Mr Levine was 41, and continued until 1993. During his career, Mr Levine has conducted more than 2,500 performances at the Met. He made his debut there in June 1971 with Puccini's Tosca, becoming principal conductor in the 1973-74 season and music director in 1976-77. He has conducted 85 different operas and also worked with the Three Tenors - Luciano Pavarotti, Jose Carreras and Placido Domingo. He has struggled with Parkinson's disease and other health issues and now conducts from a motorised wheelchair. The accusations follow a series of sexual abuse and harassment claims made against high-profile figures in the entertainment industry.